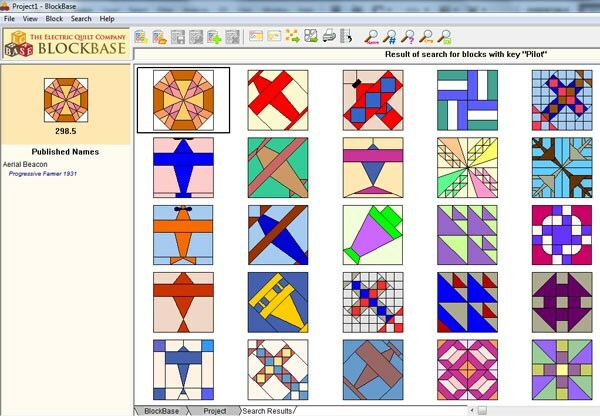 Many BlockBase owners never know BlockBase has such cool Search tools. They use BlockBase as merely an “add-on” with 4000+ more blocks for EQ7. They use “EQ7 Search” to find Blocks. That’s OK. But they miss out on fun Search possibilities. 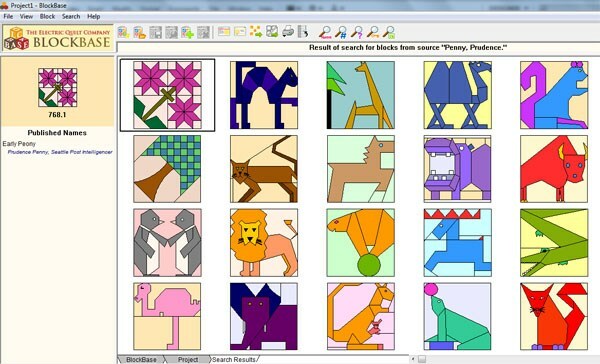 This lesson shows how to take advantage of hundreds of special search categories, only available in BlockBase. You’ll also see how to save blocks from BlockBase in a project to open and use in EQ7. It’s easy. Open BlockBase. 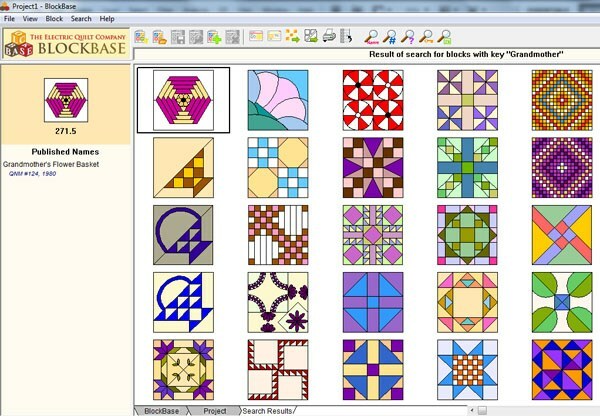 Your BlockBase may look slightly different than the pictured BlockBase in this lesson. That’s because there are 2 versions. Click HELP > About BlockBase. You’ll have version 2 or version 2.2. Both have the same blocks, but 2.2 has an updated look. Close the About box. Let’s start with something simple. Click the Four Patch category. Not so simple. You see 23 different groups, each based on a Four Patch. So much to browse through. 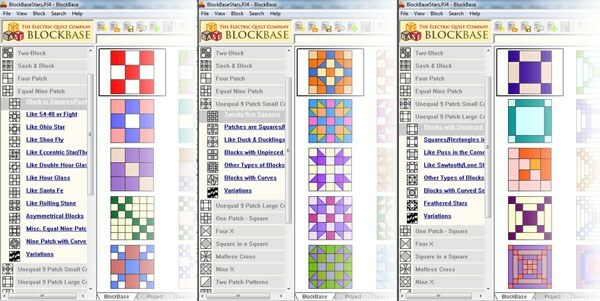 And BlockBase has 202 different groups of blocks, each with as many as 80 blocks. Too much! Let’s get help from the Search tools. IMAGINE: You’re designing a BOM with 12” blocks. 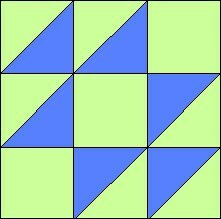 To make it easy to sew, you’ve been told to find blocks based on the same grid. DO IT: Choosing blocks based on a grid with patch numbers that divide evenly into 12 will keep patch sizes even. Is that all? No, no. Blocks from many other categories would work as well. It’s easy to find blocks based on structure as that’s how blocks are organized in BlockBase. IMAGINE: You want PERIOD blocks — something no one else has used in awhile. DO IT: Click the Search by Source button. A block’s “Source” is where it was first published. Scroll down until you find “Penny, Prudence” and click it. Click Search. Being able to quickly find lots of blocks from the same source can be very handy. Prudence Penny designed a group of clever pieced animal blocks perfect for children’s quilts. And they still look fresh and new today. She also designed non-animal blocks. Scroll to see them all. 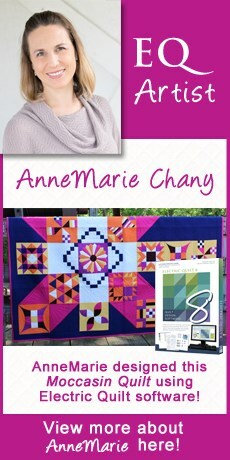 IMAGINE: Your sister, a teacher, would like a quilt. Searching by Keyword lets you search by specific pre-set groups. Scroll through them, looking, until you find Teacher. Click Teacher > click Search. Many blocks have more than one name. Look at the Published Names on the left. 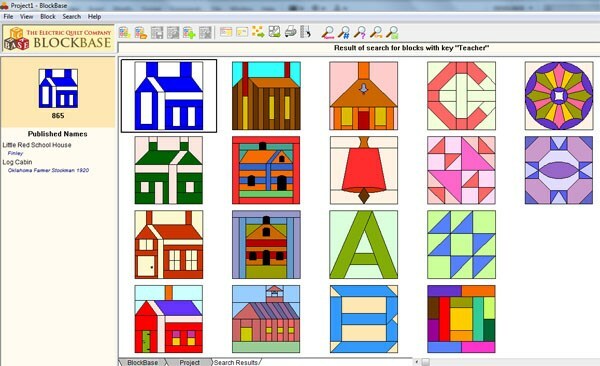 You’ll see the same block is also known as Kindergarten Block – that fits the Teacher theme. You can see it was published under this name in 1938, and if you want to know more about where it was published, Needlecraft Supply, just click blue source name link. IMAGINE: You need Civil War era blocks for a sampler. 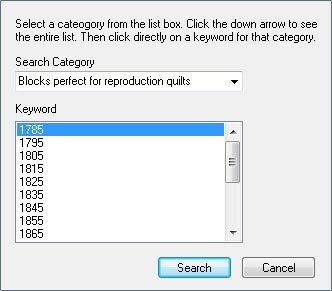 DO IT: Click Search by Keyword again > click the down arrow beneath “Search Category.” Scroll back up to the top and choose Blocks Perfect for Reproduction Quilts. 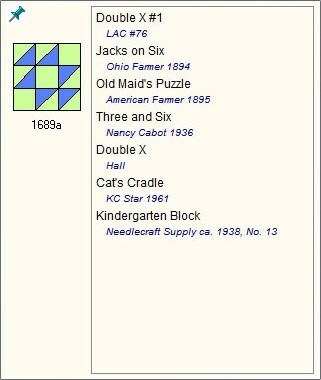 This category contains Barbara Brackman’s suggestions for the most typical blocks for every decade — not EVERY block – but the MOST TYPICAL. And as Barbara says, remember, the blocks from a decade or 2 earlier would also be appropriate. But wait! We mentioned “hundreds of search possibilities.” For fun, spend time using Search by Keyword, and seeing all the categories. You may find blocks for: Marriage …Firefighters…Card players…Fortune-Tellers…Sailors…Pilots…Grandmothers…Baby…Colonial Times … Holidays of all kinds…and dozens, dozens, dozens more categories. Gather some blocks into a project. To do so, click any block, then click the Add to Project button on the top menu bar. Keep adding blocks until you have a group you want to take into EQ7. Click FILE > Save when ready to save your BlockBase project > you can save the project anywhere easy to find again, since you’re going to open it in EQ7. So navigate to DESKTOP > name the project > click Save. Then exit (or not) from BlockBase. Your option. Open EQ7 > close the tip of the Day. On the Open an Existing Project tab click the “Click here to open a project not listed above” file folder. In the “Look in:” window on top, navigate to Desktop > find your project > click to select it > click Open. The Sketchbook opens, showing blocks. Close the Sketchbook. Now we’ll save this project in EQ7, turning the BlockBase project into an EQ7 project. 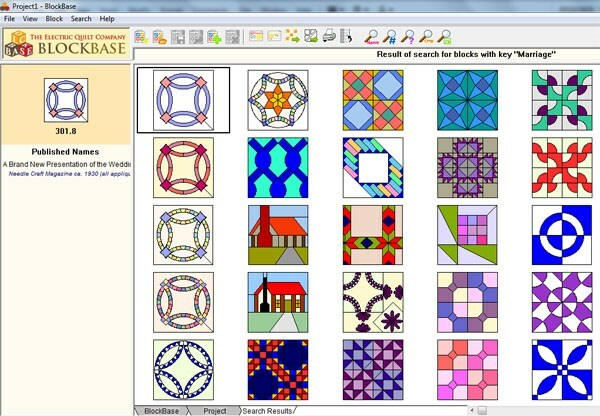 That way you’ll be able to use the blocks to design quilts, and save the quilts. 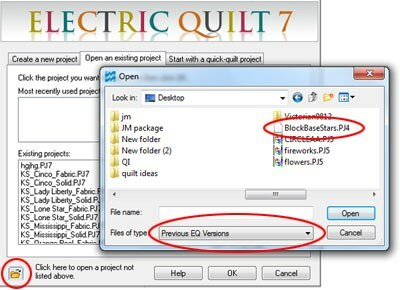 Click the down arrow next to Save in: window > click (My) Documents > My EQ7 > PJ7. Type a name for your project in the File Name box. Click Save. Now your BlockBase blocks are saved in an EQ7 project file. Anything new you add to the Sketchbook will automatically be saved in this project for you. Have fun experimenting with these blocks in EQ7.